Baselworld 2017 is underway and ends on March 30, 2017. This popular watch and jewelry show is held each year in Messe Basel, Switzerland. 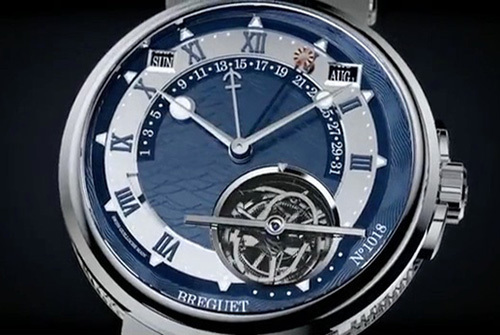 Luxury watch brand Breguet announced their new Marine Equation Marchante 5887 luxury watch. The House of Breguet launched this prestigious watch model – Marine Equation Marchante 5887 – and wowed the Baselworld crowd. Breguet continues to define the luxury watch industry by integrating both marine navigation and astronomy into its luxury watch line. This fine timepiece becomes part of Breguet’s contemporary Marine collection. This “Grande Complication” watch comes with a 43.9mm-diameter case, made of either rose gold or platinum. The stylish platinum model includes a blue dial and a rhodium-plated movement. In addition, the rose gold version surrounds a silvered dial and has an anthracite movement. Both Marine Equation Marchante 5887 watch models exude aesthetic balance and elegance. As you peer through the watch’s sapphire caseback, take note that the bridges have been carefully placed to depict in incredible detail the “Royal Louis.” This well known ship was the first rank vessel in the powerful French Royal Navy. The Marine Equation Marchante 5887 luxury watch barrel is beautifully adorned with a windrose motif. This was done to recognize the importance of astronomical navigation. The watch has self-winding movement and the oscillating weight is located on the rim of the calibre. The challenge for marine navigation has been the issue of time. Since the days of Antiquity, the basis of time has been by using the sun. Using sundials historically has focused on a key problem. The visible motion of the sun is irregular. Thus the precision of timekeeping continues to evolve. Eventually true solar time has been substituted by mean solar time. Therefore, each day has now become the same duration – exactly 24 hours. Breguet continuesto concentrate on its ladies collection. This new watch includes a gorgeous array of shimmering gems, mother-of-pearl, in addition to other precious materials. The end result is spectacular. The new Marine Equation Marchante 5887 watch is simply stunning. The watch is design with two apertures. The first is found 10 and 11 o’clock. The second aperature is located between the 1 and 2 o’clock position. Combined they display the days of the week, plus the months and even leap-year cycle. You’ll notice the date is shown inside the chapter ring. This is accomplished by a retrograde hand that’s tipped with an anchor motif. The hand seamlessly sweeps across an arc that runs from the 9 to 3 o’clock position. between 7 and 9 o’clock. This beautiful luxury watch from the House of Breguet is perfect for that special person in your life. A birthday, anniversary or just to show your love and appreciation. Receiving a luxury watch is always a joy by the recipient. We hope you enjoy reading our luxury blog. Come by soon to read more luxury watch industry news like the new Marine Equation Marchante 5887 watch model from Breguet.